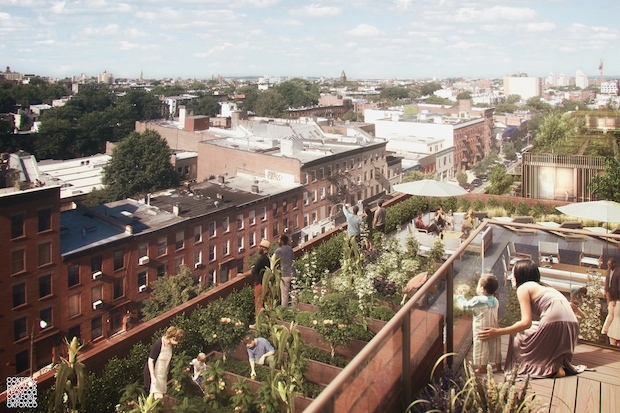 PROSPECT HEIGHTS — Months after officials demanded developers stop dragging their feet on affordable housing construction at Atlantic Yards, they have renamed the project Pacific Park and hired designers to create the next two buildings and a public park. The developers, Greenland Forest City Partners, released a series of renderings of the new projects Monday, the same day it announced the rebranding, which was first reported by Curbed. The company chose the new name to highlight the 8-acre Pacific Park, which is set to be placed in the center of the project’s planned properties, according to a press release. The public park, touted as “the borough’s newest open space,” will be located on the block bounded by Atlantic Avenue, Vanderbilt Avenue, Dean Street and Carlton Avenue and will be designed by Thomas Balsley Associates, the landscape architecture firm behind the Heritage Field at Yankee Stadium and Chelsea Waterside Park. The renderings of the new public green space show paths leading from the sidewalk between the site’s buildings, opening up to a wide lawn, curved walkways and trees. Additional details about the park design will be released some time before December, developers said. Anchoring the park’s southeast and southwest corners will be two buildings designed by COOKFOX, the architecture firm behind the Bank of America tower and parts of the City Point development in Downtown Brooklyn. The first new building, the developers said, will break ground in December at 535 Carlton Ave., an 18-story property that will entirely be affordable housing. The 285,000-square-foot building will have 298 rental units ranging from studios to three-bedrooms. Renderings of the building, which will sit at the northeast corner of Carlton Avenue and Dean Street, show a multi-level glass and brick facade with first-floor retail space and multiple roof terraces, according to developers. The second planned building at Pacific Park is 550 Vanderbilt Ave., an all-condominium, market-rate building located at the northwest corner of Vanderbilt Avenue and Dean Street. The 330,000-square-foot property will have 275 units that will range from studios to four-bedrooms, developers said. Richard Cook, partner at COOKFOX, called the two buildings “the urban bookends” that bracket Pacific Park, which will lay in the middle of the rectangle bounded by Atlantic Avenue and Dean Street between Carlton and Vanderbilt avenues. The construction of 535 Carlton Ave., set for December, follows a deadline for the project agreed upon in late June by the developers, the state, mayor’s office and several community groups that had put pressure on Forest City Ratner to complete affordable housing on the site. The new timetable requires the developer to complete all affordable housing on the site by 2025 or face fines of $2,000 per unit per month. If construction of 535 Carlton Ave. has not begun by December, the developers will face a $5 million fine.